Pick your ultimate emerald tiara! These two have always been popular, so we'll just get them out of the way first. That's the Duchess of Angoulême's Emerald Tiara on the left and Queen Victoria's Emerald and Diamond Tiara on the right. Another permanent fan favorite: Grand Duchess Vladimir's Tiara, which does triple duty as an emerald tiara, pearl tiara, or all-diamond tiara (when worn with no drops). The tiaras at right above offer similar flexibility (from top to bottom): the Gloucester Honeysuckle can have an emerald, diamond or pink topaz at the center, Queen Fabiola's Spanish Wedding Gift Tiara has a green option in addition to rubies and aquamarines (though you may not believe those are emeralds - I'm not convinced myself), and the Dutch emerald tiara can also be outfitted with pearls. Emeralds come in big gun form: Empress Joséphine's Emerald Tiara (left) is Queen Sonja's stand by for major occasions, the Danish Emerald Parure Tiara (right, above) owns a spot in the crown jewels and some prestigious outings from Queen Margrethe, and the Greek Emerald Parure Tiara (right, below) is often used by Queen Anne-Marie for her important tiara-wearing business. Luxembourg has at least two options: the Chaumet Emerald Tiara (left), if you like your emeralds egg-sized, or the Van Cleef & Arpels Necklace Tiara (right), if you prefer an option to use as a necklace too. Green being such a nature-iffic color (technical term), floral and wreath forms aren't uncommon (clockwise from top left): Princess Benedikte's Floral Tiara has one small central emerald (that can be switched out) for those that prefer emeralds in smaller doses, the Mellerio floral tiara formerly owned by the Leuchtenberg family (currently owned by the Albion Art Collection) is a little more balanced, the Boucheron emerald wreath tiara featuring emeralds set in black gold that's been worn by Queen Rania is for those that take their emeralds very seriously indeed, and and the wreath tiara worn by Archduchess Francesca of Austria is a more even distribution. 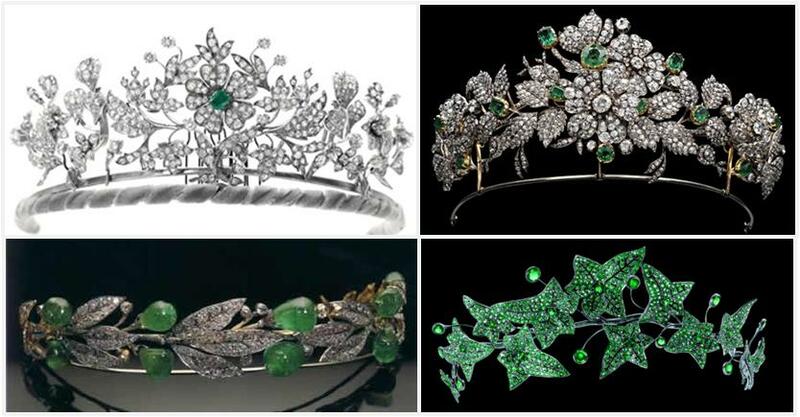 Emeralds were a popular stone in the Iranian crown jewel collection: Empress Farah's favorite tiara with emeralds as well as colored diamonds (left, top), the tiara worn by Queen Soraya during her wedding festivities (left, bottom), Princess Shahnaz's tiara (center, top), Princess Shams' tiara (center, middle), and Princess Fatemeh's tiara with emeralds surrounding a pink spinel (center, bottom). Queen Saleha from Brunei also has has a large emerald and diamond tiara (right). The von Donnersmarck emerald tiara (left, top) set auction records when it was sold in 2011. The Harcourt tiara (left, bottom) was also auctioned in the past few years. And finally, at right, an emerald tiara worn by Alexandra Feodorovna. And there are, as always, many more options out there for your review. Ready to vote for your favorite? -I will also count the number of "likes" or up arrows on those comments, so you can vote that way too. -Non-royal tiaras and tiaras that no longer exist are fair game too. The blog returns on Tuesday! UPDATE: Thank you for your contributions, voting is now closed!